This is a provocation with deep roots. 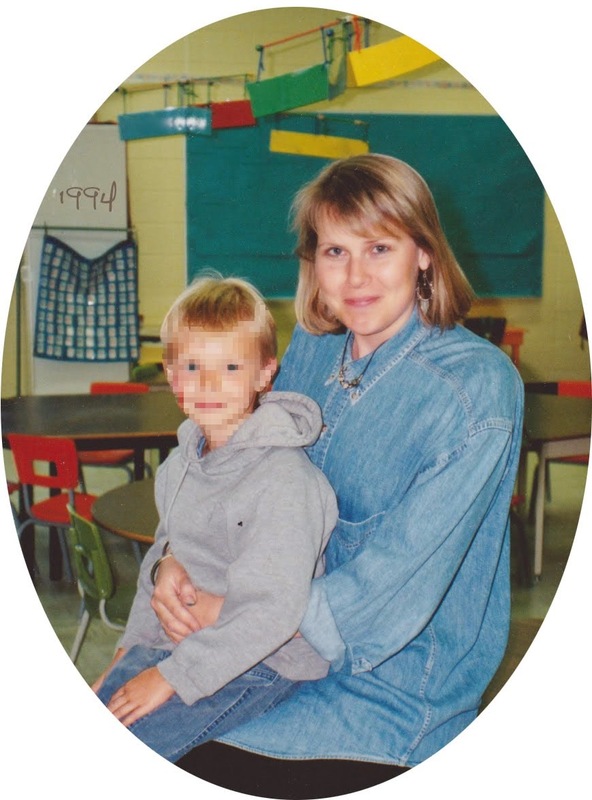 It is intimately connected to a specific place (Peace River, Alberta) and a specific history. It was crafted with the intention of helping all of my students — but especially my Aboriginal students — connect to their history here. 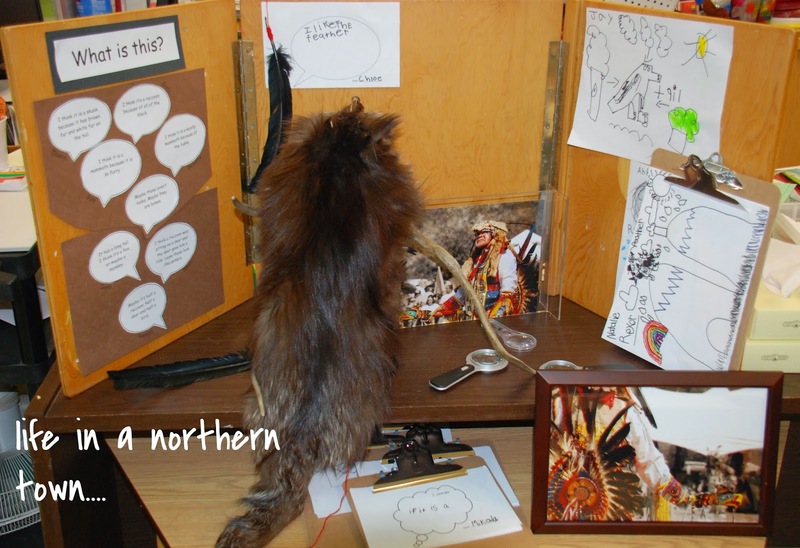 This is a hunting and trapping part of the world, settled by fur traders. Many of my students, by age six, have already been hunting with their families. They are not shocked or upset by fur. Twenty years ago or more, when my husband and I were still just dating, he brought me home a present from a trip to Yellowknife. Yellowknife is a small city in the Canadian north, even farther north than where we now live. 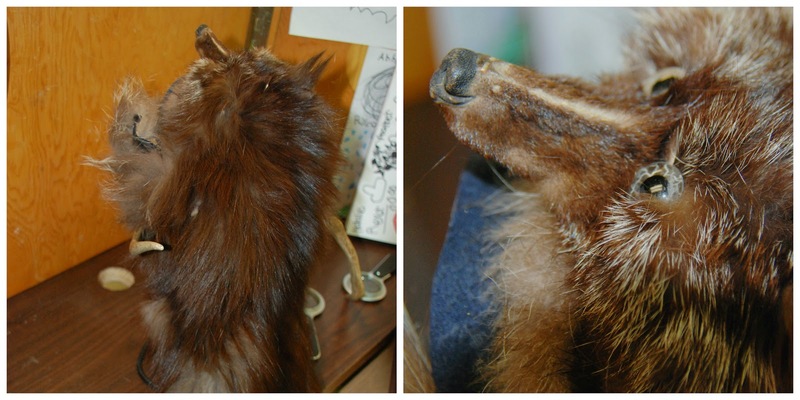 Headdress made of an Arctic fox, deer antlers and eagle feathers. For years I have taken it to school to show my grade ones how an animal’s fur changes from summer colouration to winter, or vice versa. My fox is brown with a sprinkling of white hairs coming in on the tail and the face. I’ve used it to talk to the kids about how animals change their coats one hair at a time. This year, because I’ve been learning about the Reggio Emilia school of thought, I wanted to know what the kids would wonder about such an object if I didn’t tell them all about it up front. If I let them be curious. I took the headdress in and supported it on a wrought-iron hat stand. I placed magnifying glasses with it, but asked them not to touch it. (It is starting to disintegrate.) Then I asked them what they could see, what they thought it was, and what it had been when it was alive. I asked them to draw the animal (real or mythical) they thought would have had thick fur, a pair of antlers and a half a dozen feathers. Where would it live? In a nest? In the woods? In the mountains? Kids' drawings of imagined animals. 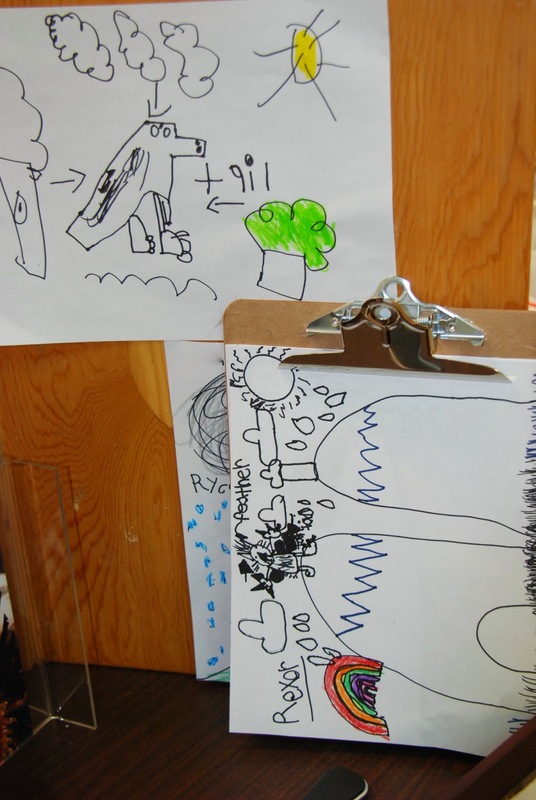 The kids each drew what they imagined, and I displayed some of the pictures on the display board behind the headdress, and some on a clip board so they could flip through and look at it. 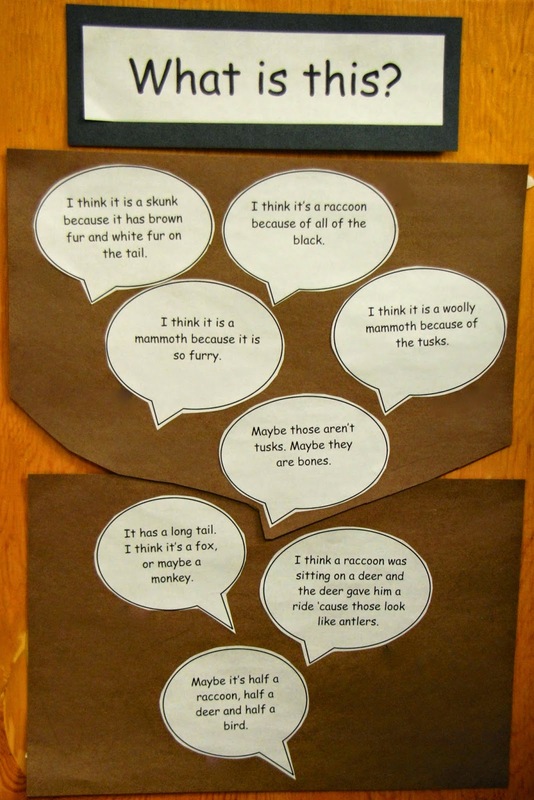 I also transcribed some of their thoughts from our discussion onto speech bubbles and displayed those. I left out clipboards with paper for them to record ideas and questions on. Aboriginal elder Dave Matilpi in full regalia. 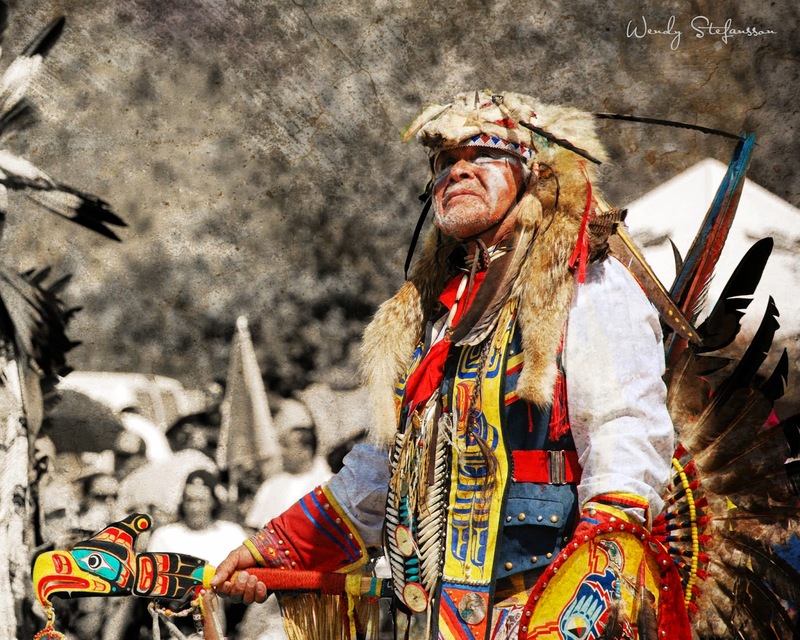 Pow-wow 2009. Aboriginal elder Dave Matilpi. 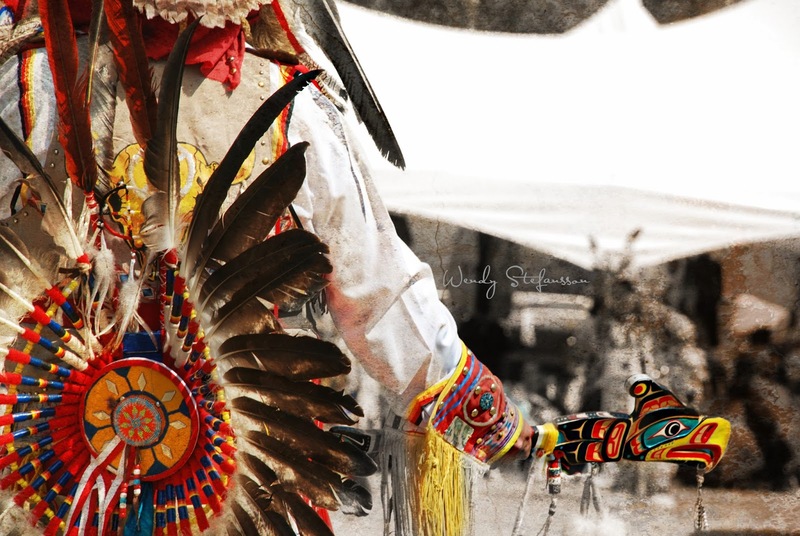 Pow-wow 2009. Later, I showed them a few pictures of a local Aboriginal elder by the name of Dave Matilpi. The photos were taken at our annual local pow-wow a few years back, and in them, Dave is wearing a headdress made of a fur. (Red fox, I think, but I’m not sure.) He is dressed in full regalia. I asked the kids why he might be wearing this headdress, and what else they noticed that he was wearing that was unusual. I showed them a video on the Town of Peace River's website that showed Dave and others dancing at the pow-wow. We talked about “traditions” and how “traditional” dance forms (including the Scottish dancers we had seen earlier in the week) are different from “modern” dance. How traditional music is different from modern music. How traditional dress is different from modern dress. And how all cultures have traditions that are specific to them. Then, I feel like this provocation stalled. When I stopped directing it, it stopped going anywhere. The kids still like to play with the magnifying glasses, but they're not really curious about the headdress. Maybe the whole activity was too teacher-generated from the start. Or maybe it's just not open-ended enough. Maybe it's just gone as far as it can go. Maybe I should just be glad I accomplished some of my Social Studies curriculum objectives; with a side order of Science.